As I sit down to write this piece, I feel like I need to make a couple of statements before diving into the main topic at hand. First, in a recent post I raised the question of why parents might choose charter schools, but please don’t mistake my deeper understanding of this issue as a softening of my position on charter school growth (as some may have tried to insinuate). I am as opposed to the concept of charter schools as I’ve ever been; I’m just more opposed to hypocrisy, and at present, Nashville seems to be suffering more from the latter than the general issue of charter schools. I will also add that I don’t understand how people can support a moratorium on charter schools and not devote an equal amount of time to ensuring that our current schools have all the resources needed. How do you look a parent in the eye and tell them you have stopped charter school growth, but as a result, their child will be going to a school with 23 portables, which should get warm after the first hour or so, but they will need a coat as the bathrooms are in the main building? Secondly, Diane Ravitch was kind enough to pick up my last piece on the situation with Metro Nashville Public Schools’ new director. She used stronger language at the time than I probably would have used, but upon reflection, it was the right language. You see, what her critics missed was that she didn’t call for Dr. Joseph’s immediate dismissal, but rather “If the elected board can’t straighten out this mess and revise Dr. Joseph’s contract to assure that he works for the board – the board does not work for him – then it’s time to cut their losses and terminate his contract.” That’s a little different than the hyperbole shared over at Education Post. I guess that Common Core close reading strategy hasn’t extended to adults yet. In response to my recent blog post, the MNPS Communications Department issued a memo. It stated, “In looking to hire the best executive team possible, Dr. Joseph sought to bring people to Nashville who have the experience and knowledge necessary to make major improvements to our educational system.” I think that’s a very reasonable statement and one that I could get behind. But unfortunately, I have access to Google and LinkedIn. So let’s take a look at a few members of the new executive team. Plenty has already been said about the Chiefs, so let’s look at the next tier, the Executive Officers and Directors. Quite a few of the positions at this executive level did not exist last year, including 2 of the 3 that I discuss below, and all come with a salary of $155k a year. Hmmm…. I see that she was a research assistant at the University of Maryland from 2010 until 2013. 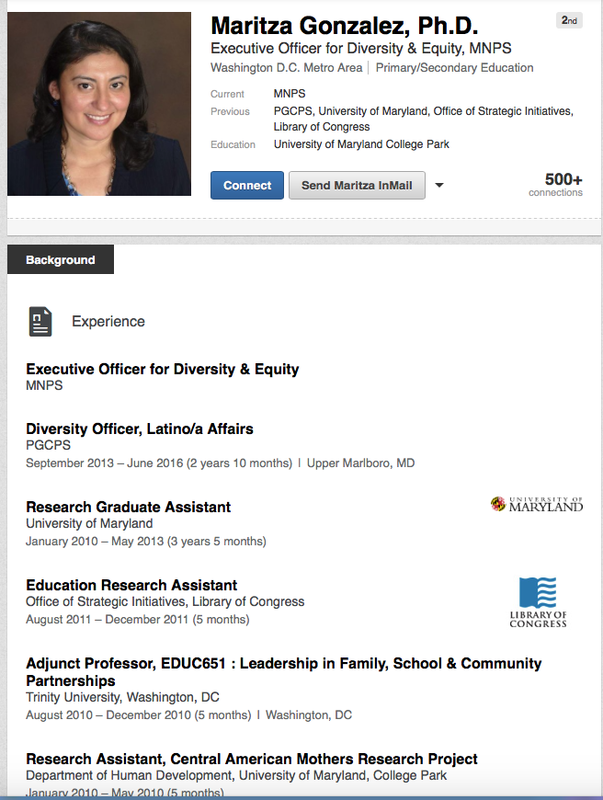 That’s when she was hired by the CEO of PGCPS as a Diversity Officer, Head of Latino/a Affairs. Gonzalez herself described her role, which was “to provide support and a point of contact for Latino families in the county, to get information to Latino communities, and to serve as an intermediary between Latino families and businesses, government, the school system and other agencies.” That’s a very valuable role, but I don’t see anything about K-12 instructional experience in her profile. She does have a Doctorate, but Dr. Gonzalez earned her Ph.D. in Higher Education, Student Affairs, and International Education Policy, as well as a Master’s in Education Leadership and Policy Studies, a Bachelor of Science in General Business with an International Business specialization, and a Bachelor of Arts in Communication Studies, all apparently from the University of Maryland at College Park. It appears that the only thing she has ever taught was a college course as an adjunct professor. All theses degrees are very impressive, but I’m unsure of the relevance. I don’t see experience with Kurdish, Burmese, Thai, Egyptian, Syrian, or Iraqi children – just to name a few – in her work experience either. These are just some of the diverse groups of students who make up MNPS, and I would think some experience with these groups would be essential to this new position. This lack of evidence leads me to question whether there is anything in her past experience that warrants a salary of $155k a year, as well as being in charge of our very successful EL department. Remember, this position did not even previously exist in MNPS, and while I can see the potential value of it, should it really be powered with providing instructional plans for our some of our most challenged kids? I don’t know. One thing that I do know is that Gonzalez and Sito Narcisse recently got married and enjoyed a honeymoon in Mexico. For those of you who don’t know, Narcisse is the newly appointed Number Two person in the district as Chief of Schools and is also from PGCPS. Anybody else see a problem with this? Because I see a huge one. My stepdaughter once came to work for me, and I told her, before she started, that she would have to prove twice as qualified and work twice as hard because of our relationship or people will say she only got the job as a result of our relationship. I would think the same holds true here a hundredfold. Again, I ask the question, are we really going to take our neediest children, some of them fresh from refugee camps, and put an inexperienced, under qualified individual – who is also in a romantic relationship with the Number Two person in the district – in charge of their educational outcomes? Yeah… that’s a big problem. Noticing any similarities? Yeah, me too. It was nice of Carrasco to allow his department at MNPS to insert his company’s logo into the presentation. I have to ask though, why is the logo for an MNPS employee’s private company included on a presentation by the department he heads? That’s a head scratcher. And if his company is branded in our priority school presentation, does that mean his company will be hired to work with these priority schools, or L5 schools? If so, what does that mean for vendors who are already doing this work in the district? Some of those contracts, which the MNPS board has previously approved, have already suddenly been cancelled with little to no conversation taking place between participants. 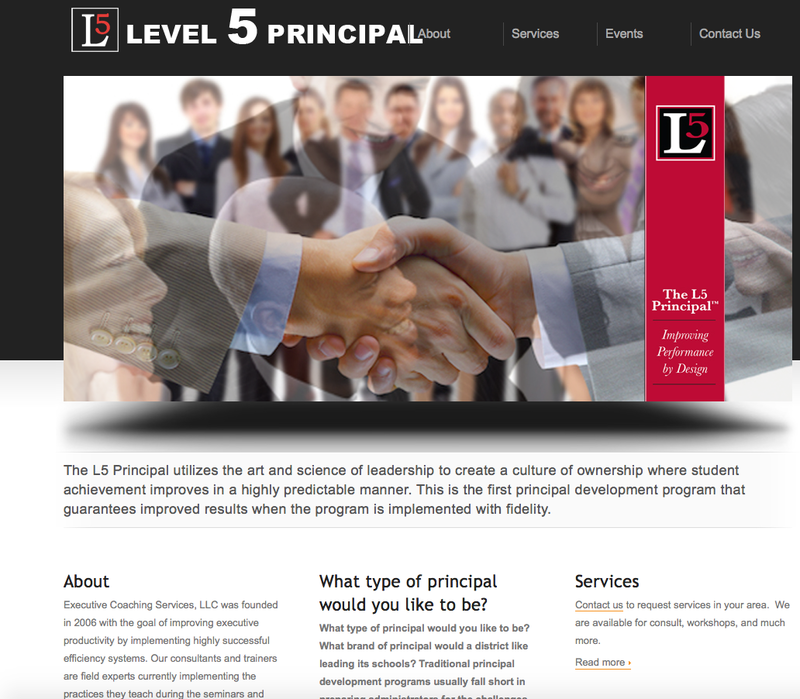 Will Carrasco be able to market the L5 schools’ success as the work of his company? My speculation, devoid of any counter evidence yet, would be that Carrasco is building a brand off the backs of our neediest kids, and we are paying him $155k to do it. A brand that, in the future, he would be able to sell to other districts based on his exclusive work within MNPS. I would love to open a restaurant, but I doubt I’d find a current restaurant owner willing to let me develop my business plan and brand it within his establishment while he pays me a large salary. This situation just reeks of unethical behavior. Unfortunately, this is not the first time this question has surfaced in regards to Carrasco either. When he was hired, MNPS issued a press release that mentioned he was Principal of the Year in 2007. Well, they failed to mention what happened in 2008. In 2008, Carrasco was investigated for possibly conducting seminars on school time by taking sick leave or otherwise leaving school grounds for his own business purposes. In other words, he was putting the needs of his business before the needs of his students. He quickly shut things down once people started asking questions. Particularly troubling is the following quote from the Washington Examiner article in regards to Carrasco’s role in the company: “… [Carrasco’s] role in the company is apparent only on incorporating documents registered with the state.” I wonder why he made such a big effort to conceal his role in his company. Very troubling indeed. In all fairness to Carrasco, the district in Maryland where he worked did announce that the allegations of his involvement in private consulting were “thoroughly investigated” and “not substantiated.” At the same time, however, they also announced him as the new Director of Secondary Leadership Training. It’s worth noting that Carrasco was cleared and promoted by then-superintendent Jerry Weast. It just so happens that Weast now serves as a mentor and informal advisor to Dr. Shawn Joseph, MNPS’ new Director of Schools. And Joseph is the one who brought Carrasco to MNPS. Let’s do one more, just for fun. Tamika Tasby was recently hired as the new Executive Director of Professional Learning. Surprise! She’s also from PGCPS, where she worked as a Graduation Program Specialist in the Office of Secondary School Reform. She earned a salary of $105k per year there. 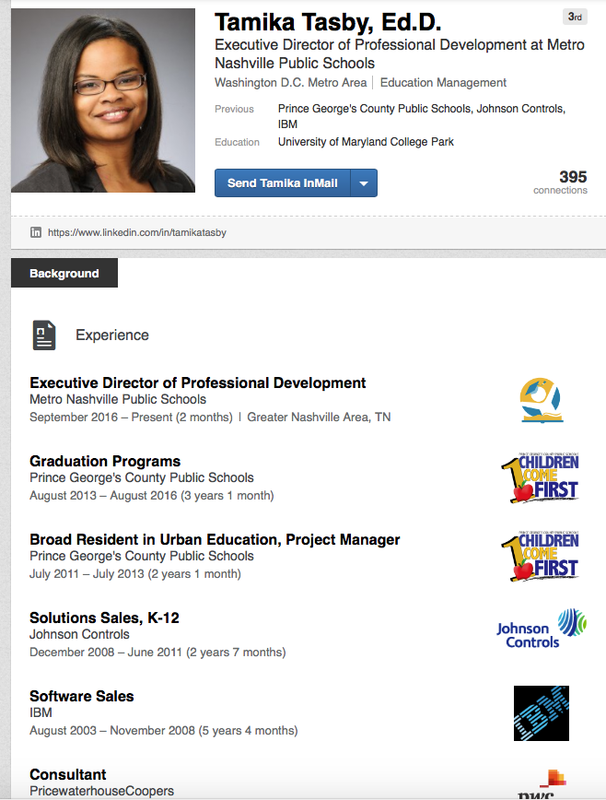 I assume as an Executive Director in MNPS, she’s making $155k per year. I’m not certain of this, but she’s definitely making a lot more money than she did in PGCPS – and she’s an executive now! Notice anything missing? Yeah, I don’t see any classroom experience either, or for that matter, any professional development experience. I do see that she was a Broad Resident in Urban Education. And if you’ve never heard of the Broad Academy, be aware that they take people with no experience in education whatsoever and “train” them to become school administrators. Tasby also just earned her Ed.D. from the University of Maryland, but still, she appears to have no relevant educational experience to merit this executive position. Yeah team! One hire is an isolated incident, two is a coincidence, but three is the emergence of a pattern. Since we are spending hundreds of thousands of dollars on creating a new culture in MNPS, I’ve been keeping an eye on PGCPS. And with apologies to the fine folks of Prince George’s County, what emerges is a very disturbing picture. To put it bluntly, that culture is a dumpster fire. It’s so bad, that last week, the NAACP called for the firing of current CEO Kevin Maxwell. Particularly disturbing to me is this recent quote from former PGCPS school board member Patricia Fletcher, who filed an ethics complaint with the district: “Fletcher said that this issue should be concerning to taxpayers because it is part of a bigger problem that she recognized when she served on the board. ‘Political favors,’ she said. ‘Because a lot of people who were getting huge contracts, you dig deep, do a deep dive, and you would see that either they are a family member of someone who made big campaign contributions to an elected official.’” Evidence seems to indicate that we are starting to incorporate some of the same elements. I don’t think I’m good with that. My point is, these are all worthy accolades, but while adults are busy patting each other on the back, who is watching out for our neediest kids? Isn’t making sure that they are given the best educational resources possible part of keeping Muslim students safe? Have NPEF and Renata Soto done everything to ensure that all of our educational programs for English Learners will be fully funded? Did everybody just assume the game was over with the hiring of a new director of schools and that we would simply abdicate all oversight upon the hire? Was the whole concept of trust but verify deemed invalid? Was the plan just to go back to our charter school battles and leave everything else up to the new director? That’s like playing half a football game. In Nashville, we spend way too much time engaging in the charter school debate and not enough time on improving our existing schools. At some point, we need to stop running everything through a charter school lens and how it will either increase or decrease the number of charter schools in Nashville and how reformers are going to react. The charter school fight, for the most part, is a philosophical issue. 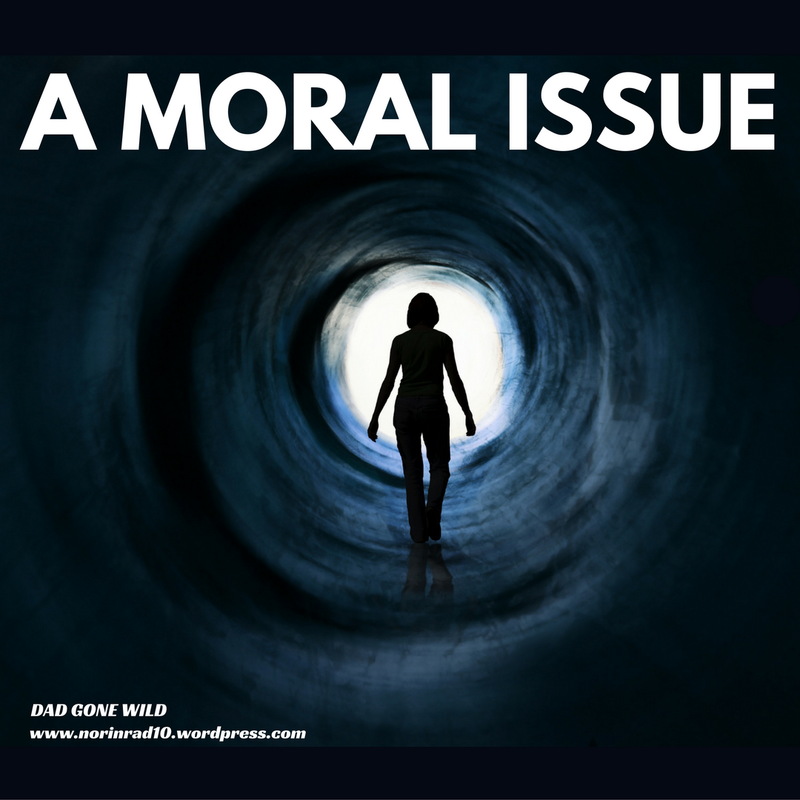 But putting our neediest children in the hands of under qualified people or people with outside motivations, at inflated salaries, is, in my eyes, a purely moral issue. I am trying not to be too hyperbolic here, or get too angry, but I have weekly contact with these kids, and I see how traumatic their lives are. And to shortchange them in this manner keeps me awake at night. I don’t understand how you justify giving them anything less than full priority. Their short lives have already been traumatized, and is it our charge to give them the same tools for a better life as we would any other child. And to put it bluntly, we are currently falling short. MNPS Board Chair Anna Shepherd made a speech from the chair at the last board meeting that I can only take as being directed at me. In her speech, she leveled accusations at people trying to “out blog” each other and advised that if people had concerns, they should call their board member and address those concerns over the phone. I tried that for two months with no results. That’s why I started to write these posts. I have no interest in the political agendas of other people, and I actually hold in contempt anyone who would try to use these posts for political fodder. In fact, you’ll notice a lapse between my posts on this topic, and that’s because I keep hoping that somebody will take corrective action so I don’t have to continue writing about it. In closing, I feel the need to point out a couple of things. First, no one is paying me to write these posts. I am simply a parent of children who attend school in MNPS and who is paying attention to how things are being run. I see inequities and things that aren’t getting done, and so I do some research that results in these posts. Second, no one is putting me up to this. I am writing on my own accord. As a friend remarked, I’m not Edward Snowden. This ain’t WikiLeaks. I’m just a guy with an overinflated sense of morality who’s willing to do basic due diligence and talk to people. In getting information for my posts, there is no one source I use. I talk to educators throughout the district, past and present, on a regular basis. It’s amazing what you find out when you just talk to people about what they think is important, not just your priorities. I’ve made a very concerted effort to earn their trust, something nobody else seems to feel is important, and so they share some of what they know with me. I’m honored that they share what they do with me. It’s certainly not everything, and I always try to be cognizant of how what I write will affect their careers. I would suggest that others in MNPS dedicate an equal amount of time to earning that trust if they hope to lead effectively. Trust can not be demanded; it can only be earned. You might find that people are a little quicker to get on the bus if they trust you, and then we wouldn’t have to worry about anyone accidentally getting run over. We truly have some incredible educators in this district, and it’s high time we recognize them and celebrate them. We have a moral charge to our children to be diligent in pursuing policies that directly affect them. They are, after all, the future. A principal once said to me, we need to always remember that they will remember how we treat them because, as Maya Angelou writes, “At the end of the day people won’t remember what you said or did, they will remember how you made them feel.” I’m glad the MNPS school board feels they are doing meaningful work that will create a better governance body. But is that work worth sacrificing a year of a child’s life by failing to execute their primary charge of providing oversight? I don’t think that’s a hard question to answer, and I beg the board and others to start assuming that role. If they would do that, I’d be more than happy to go back to writing posts on philosophical issues and leave the moral ones in their hands. Thank you for your deep analysis and for staying on top of the PGCPS arrivals to Metro Nashville Public Schools. Corruption involving these guys is real. We must disrupt their diabolical agenda. Welcome to the corrupt world of Maryland politics (and education in MD is politics). This runs rampant through our state, but it gets worse the closer you get Washington DC…and PGCo is nothing but a suburb of DC. Charter Schools and lots of DC cash make for lots of corruption. But keep a keen eye on Marasco. Just a gut feeling that you will start hearing about a new “elementary school model” (Howard County) that will need well trained Principals to lead. It will come fast and furious before you know it. The parents will be sold on how wonderful it will be (until it isn’t), and then the Superintendent will want to delay (or forget about) any promised studies for effectiveness/satisfaction. This is how we roll in the once great state of MD. This is all troubling, so thank you for all of your research. I am beginning to think we would have done better with someone from another TN county, who knows the state and appreciates the funding issues. Dr. Looney came from a poor county, and he has been incredibly successful. Have we reached the first hundred days mark yet? If Dr. Joseph can turn around the failing schools narrative, stop the attrition at 4th grade and prioritize advanced academic achievement in zoned middle and high schools, I will forgive all of this excess, but he’s in the clock with me to start moving in that direction. I venture the opinion that we are going to see more and more effort expended to shut down the people who are asking the hard questions, not just about education but about all the issues that are undermining our republic. The carefully crafted media attacks on Black Lives Matter started months ago, and I suspect that as the anti-reform movement in education gains momentum those who are vocal in support of it will be subject to similar propaganda. Carry on, brother! I understand there is one PGCPS former employee that was given a resignation or be terminated from PGCPS as middle school principal, which she held for 1.75 years, yet was immediately hired by Dr. Joseph at MNPSD. One note she also came to PGCPS through Dr. Joseph! ! Now I understand she is heading as Executive Principal!! MNPS deserves better, however, the Board continues to make thses HR mistakes. Pingback: Critic Sees ‘Cronyism’ In former PGCPS Executives in Nashville Tennessee Hiring Fiasco. | pgcps mess - Reform Sasscer without delay. Pingback: Critic Sees ‘Cronyism’ In former PGCPS Executives in Nashville Tennessee Hiring Fiasco. | Help Change The World. The Future Of The County Is Now.